A real standout for the shade garden. 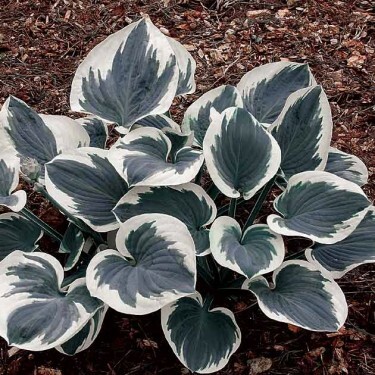 'Barbara Ann' has nice big leaves of bluish-green accented with broad, crisp white borders. This sport of Hosta 'Elegans' was discovered in a tissue culture lab in Great Britain by two technicians - Barbara and Ann. Hosta 'Barbara Ann' forms a fairly upright mound 3-4 feet across. The heavy, blue-green leaves are intensely corrugated, gently cupped, and edged by a wide, stark white margin. Short scapes of white flowers in early summer. Hostas are hardy, versatile perennials that are perfect for shaded gardens and require little care. They offer large, bold leaves often marked with contrasting colours. They thrive in all soils from pure clay to boggy ground and they usually get bigger every year. The leaves range in shape from round to lance-shaped, and colours can be yellow to green to blue, often with white, yellow or green marginal markings. Their dense foliage crowds out most garden weeds. Hostas will bear flowers, usually lavender or white flowers, that grow on tall stalks in early summer. They make a wonderful contrast when planted with small-leaved plants and most certainly add texture to the landscape.